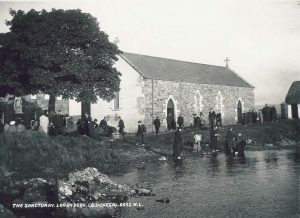 The pilgrimage has St Patrick as its patron because of his association with the monastery founded at the lake a few decades after the arrival of Christianity in Ireland. The Island is variously called Lough Derg (Lake of the Cave), Purgatorium Sancti Patricci (St Patrick’s Sanctuary or Purgatory). Today it is known simply as Lough Derg. It survives today as a living remnant of the early Irish Church. 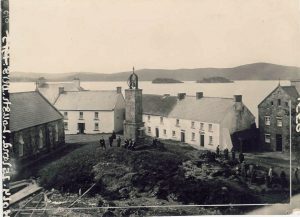 Historical records date the foundation of the holy Island in Lough Derg back to the 5th Century. History points to there probably being a religious presence around Lough Derg before the time of St Patrick and that it was common for Christians to seek to supplant pagan sites with foundations of their own. A Druidic presence near the lake would explain why a monastery came to be founded here. The monastery was founded on the island adjacent Island where pilgrims make their pilgrimage. It is known as Saint’s Island and is the location of the early monastery in the 400s. This island is overgrown and not accessible today. Station Island is the place of the famous pilgrimage, it is know locally as Station Island, after the ‘stations’, rounds of prayers that later came to characterise the pilgrimage.